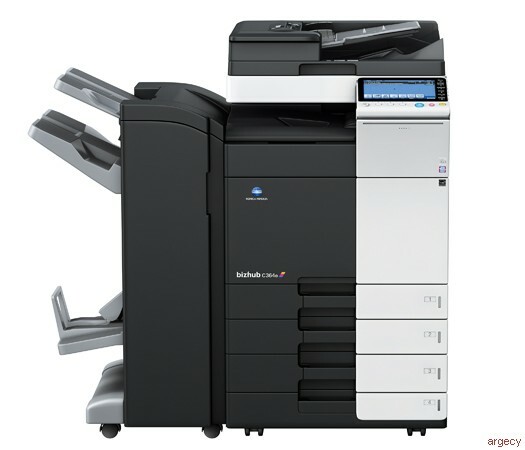 Ideal for growing businesses, the bizhub C364e is a powerful, affordable color MFP with superior Simitri HD image quality and fast 36 ppm print/copy output. Optional dual scanning at up to 160 opm brings information into your workflow faster- and enhanced touch-screen simplicity never slows you down. Printable paper size Scanning/Copying: up to 11" x 17"
Banner paper max. : 11.75" x 47.25"
1st copy out time B&W: 5.3 sec. / Color: 6.9 sec. Original format Up to 11" x 17"
JS-506 Job separator Separation for fax output, etc. 1 Maximum monthly duty cycle describes the maximum number of pages a device can output on a monthly basis.